Proponents of community water fluoridation like to say, ad nauseum, that there are “60 years of research behind” one of the “top advancements in public health in the past century.” There are not 60 years of research; there are 60 years of endorsements. The American Dental Association (ADA) is a trade organization, whose money comes from member dues, and, largely, from endorsements. Their biggest endorsement is the ADA “seal of approval” on fluoridated toothpaste (which I have no argument with: fluoride does work topically to harden the dental enamel of those at risk for cavities). Some people construe that the ADA supports fluoridation in any form. However, the ADA has very clearly stated that fluoride is BAD for infants, and that formula-fed infants should ONLY consume formula mixed with unfluoridated bottled water. How much sense does that make? Dental caries is largely a socio-economic disease. Dentists don’t like to service Medicaid patients. The poor are much more likely to suffer from caries. How likely is it that they will buy bottled water to mix with their baby formula? So, let’s be clear about the claims: the ADA endorses fluoride — it is NOT a body of research scientists and it most certainly has no credentials as a group toxicology experts. 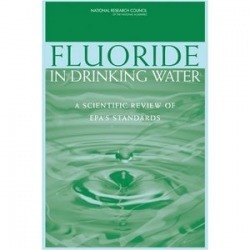 The definitive fluoride toxicology study, a 506 page document published in March of 2006 by the National Academy of Science (the United Nations of scientists) National Research council, is a compilation of all the available and credible evidence on the toxicology of fluoride. Twelve high level, hand-picked, elite research scientists spent 3 years looking at all the research on fluoride, and cited those studies that met strict criteria: peer-reviewed, published documentation of fluoride damage to brain and nerves, the immune system, the endocrine system (particularly the thyroid gland), the renal system and the skeletal system. The results are sobering and a strong recommendation against mass fluoridation. Fluoridation proponents fret that dental decay will skyrocket once the (absurd) practice of community water fluoridation ceases. Here are five peer-reviewed studies which proove that, in communities who ceased fluoridation, no increase in dental decay rates was observed. In fact, in 4 out of 5, decay rates improved! I challenge fluoridation proponents to find compelling, recent, evidence that cessation of fluoridation actually does wreak havoc on people’s teeth.